Congratulations to Mr & Mrs Wright celebrating their 65th Wedding Anniversary today, Wednesday 1 August 2018, at Jubilee Court residential care home in Hucknall, Nottinghamshire! 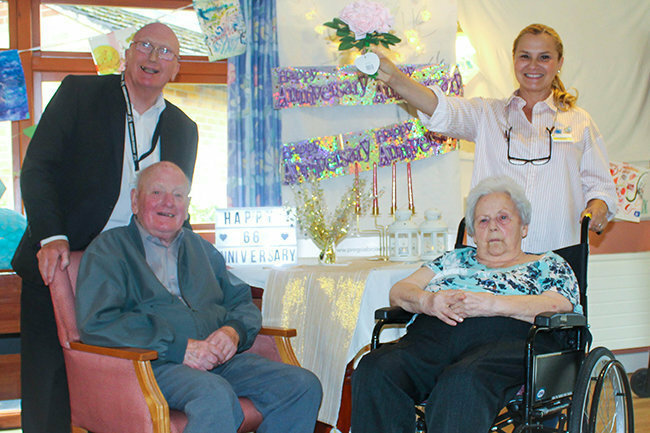 The couple will enjoy a specially planned romantic lunch, a party and be presented with a delicious celebration cake to share with their fellow Jubilee Court residents. Nottinghamshire County Council's Councillor, John Wilmott, visited Mr & Mrs Wright to offer his congratulations, and they will all be featured within the local Hucknall newspaper. To find out more about Jubilee Court Care Home with Nursing please click here.